I have been continuing my “training” to get back into the swing of things by studying all the Pokémon cards that are out right now. I came across Groudon LA and realized that it could have potential with Flygon RR. After showing Jeremy my original Flygon list, seen here, he told me that there was a variant of Flygon that uses Weavile SW to attach extra energies to Flygon with its “Shadow Charge” attack. 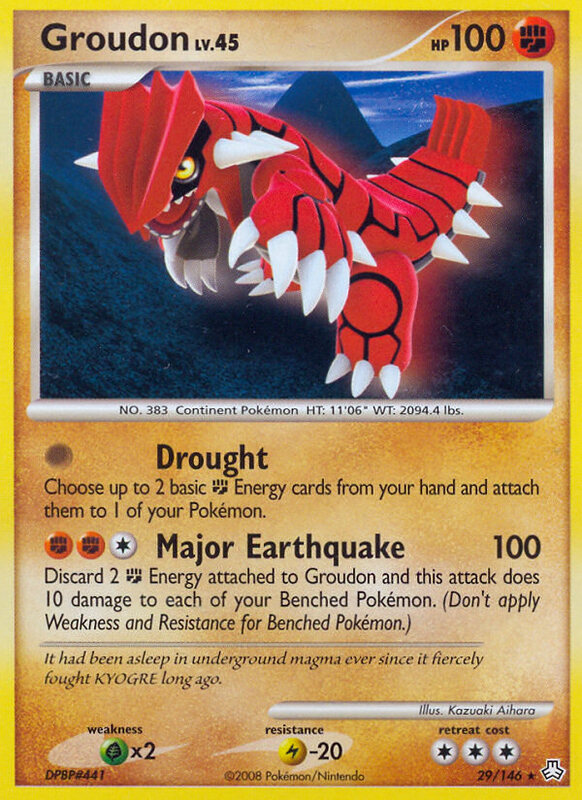 Groudon’s “Drought” attack is fairly similar, in that it allows you to get extra energy attachments for your turn. While Groudon’s attack requires you to have energy in your hand in order for it to be effective, Groudon is a basic Pokémon, which is an advantage over Weavile, who is a stage 1 Pokémon. Groudon does carry a hefty 3 retreat cost, however, when used with Flygon it will have free retreat thanks to Flygon’s “Rainbow Float” Pokémon Body. We will post a list for this Pokémon deck idea once we get a chance to test it out. If you want to try it out, let us know how the testing goes by clicking to comment below. The nice thing about weavile is that you can add 4 special darks to your deck to do a bit more damage with flygon which could help with 2KOs, but the benefits of not having a stage 1 to deal with might overcome that. Also, you want to have evolutions on your bench for Flygon’s attack, not basic pokemon. Those are all great points. Weavile’s Pokemon Power could also be useful when facing a Gengar from Stormfront due to its weakness to darkness. You could attack them with an Uxie LA for 50 damage with only 1 energy by changing its type to darkness. This is very nice damage for only 1 energy, plus you can avoid Gengar’s “Fainting Spell” Pokemon Power because you have the option of shuffling Uxie back into your deck. You’ve got to remember that Weavile adds damage for Power Swing, which is probably the biggest reason I stay wary from Groudon. Yo Alex, yea that is another great reason to stick with Weavile. This was just an idea I came up with as an alternative to Weavile. Jeremy is just getting back from vacation today, but we’ll eventually try it out and see how it does. Make an impression on You did a definitely very good position on this factor. I think this site’s structure is done pretty good. Your website is first-class I will have to read it all, thank you for the diversion from my homework! I recently came across your site and have been reading along. I thought I would leave my very first comment. Nice blog. I will keep visiting this site very frequently. Se divertir avec eurosport poker jeux gratuits. Hi! I just want to say Thanks for providing such useful information. I like your articles on here but the Rss has a couple XML problems you ought to smooth out. Great post though! You are making lots of great arguments during this article however it is tricky for me to focus on the article because of the complicated page design! Very good page! I enjoy your site, is it ok to utilize it for Rss? Very good posting! I like your blog, will it be acceptable to try it for Rss or atom? Hi Site owner. My partner and i seriously love the writing along with your website all in all! The write-up is actually very clearly written and simply understandable. Your current WordPress style is great as well! Would definitely be fantastic to discover where I can acquire that. Be sure to continue to keep up the great work. All of us require more these web owners such as you on the internet and much fewer spammers. Fantastic man! I have been to your site several times now, and this time I am adding it to my bookmarks Your discussions are always relevant, unlike the same-old stuff on other sites (which are coming off my bookmarks!) Rock on! Go to fatburner. cz. cc and learn how to lose weight easy and quickly! This is positively one of the most remarkable blogs I’ve seen. It’s so easy to tune out, but there is seriously some first-rate material online, and I believe your place is one of the few! Maintain up the excellent work mate. This website article shows how well you comprehend and know this subject.